March is for pink and red so I will have to think of crafting something in pink and red and I will take a piccy and post it here when I have. Also watch out for the buttons cunningly moving to the sidebar! In which Carie should not be allowed near yarn shops! Saturday is a day for resting, doing the laundry and SHOPPING! Admitedly, much of that shopping should be food and lovely things like that but today I also went to Web of Wool for some “train projects”. OK the blue is the first project and is a pair of socks for the beloved fiance. For anyone who knows about such things it it Opal Dreamcatcher 1235. The BF has just been shown a piccie of what the finished article should look like on the web and thinks it looks nice. Given he thinks my knitting addiction is slightly strange this is praise indeed. 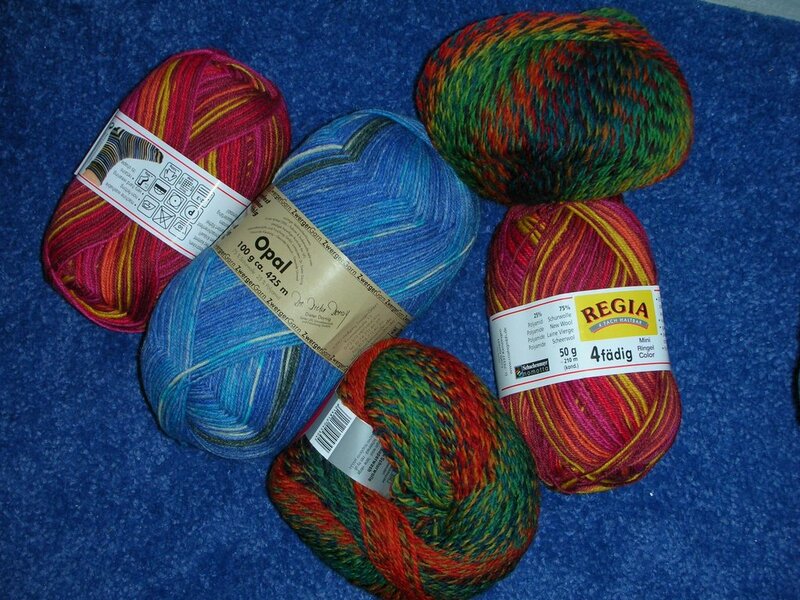 The red, yellow and pink is Regia Mini Ringels in Rio 5217 and is for me and the other isn’t done justice by the picture, it is Mexico Limbo in Hummingbird 2539 – now where did I put my needles…!